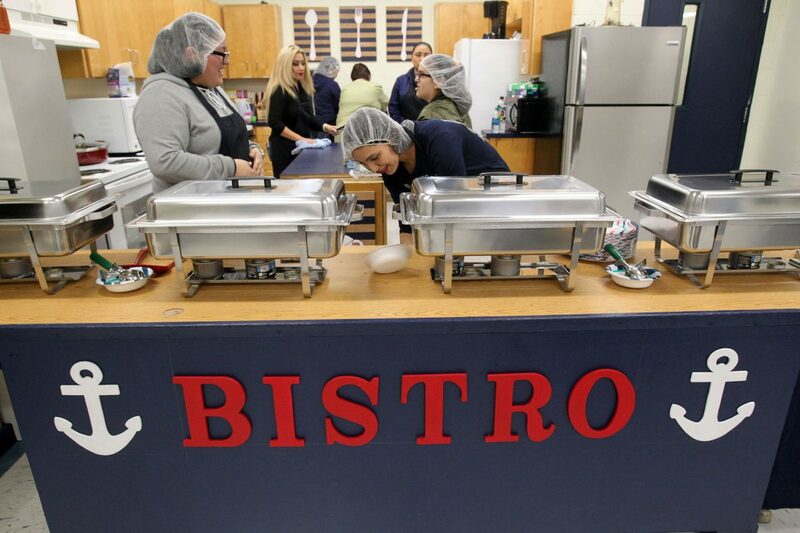 Students at Hidalgo Early College High School prepare food at their new Pirate Bistro area Friday Feb.9, 2018, in Hidalgo.The bistro is part of the special education program's efforts to teach work skills and the students are the ones who manage and prepare the food. HIDALGO — Trays filled with dishes like cream of chicken, green beans and rice, were laid in a buffet-style line. Slices of cakes where arranged on a nearby table and students waited patiently behind a ship-shaped counter for some of their first customers to arrive. The ones conducting the operations of the first bistro to open inside Hidalgo Early College High School are 10 special education students enrolled in a class intended to provide skills by letting them run their own restaurant, Pirate Bistro. Hidalgo Independent School District held an official opening for the restaurant Friday morning, which caters to teachers and administrators by serving breakfast during the first class period, all prepared and served by the students. Griselda Arismendez, an inclusion teacher, helps Jonathan Reyna, 16, at the new Pirate Bistro at the Hidalgo Early College High School Friday Feb.9, 2018, in Hidalgo. The class is part of the district’s program called Live, which was developed to provide life skills that prepare juniors and seniors in the special education program for the workforce. The idea was in the works for about a year and administrators formed a committee to identify what needs the program would focus on, Salinas said. Along with the class, the school began partnering with two local businesses, Walmart and Smokey Moe’s, where they would take the students to learn about the work process and atmosphere. Then they designed the bistro idea to allow the students to apply the skills they are learning in a place they could call their own. The students are scheduled to train at these businesses twice a week and run the restaurant three days out of the week. Students must qualify to participate in the program, which started with four and has expanded to include about 10 students. They must have a mild or moderate disability, be 17 years old or older, have completed all of their freshman and sophomore credits and have teacher recommendations. Hidalgo school district Superintendent Xavier Salinas said the district is prepared to support the program’s growth, considering the positive feedback they’ve received from students, parents and teachers involved.